“Peter says that Paul’s letters contain things that are hard to understand which lawless people twist as they do the rest of the scriptures. While Central has been exposed to a lot of good teaching on the Jewish background to the Bible - hosting several series by Ray VanderLaan for example, the subjects in Galatians might still raise some questions. I will comment on the sermons each week with the help of this book. 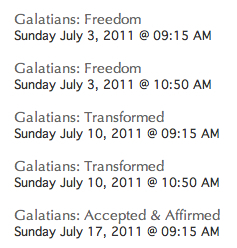 Perhaps you’ll see me at the beach with my feet in Lake Michigan, reading Galatians. The perfect summer read.